When is a pram not like any of the other prams you’ve seen? When you can completely customise the look of it, that’s when! To see just who is handing over the style design reins to you, click on through. Introducing the Britax Affinity stroller, a stroller that lets you choose the look that best depicts your style through their mix and match frame, seat base and fabric system. First up, you choose your sleek aluminum frame in either white, silver or black. Then you turn your eye to what Affinity Colour Pack takes your fancy – the pack includes the canopy, bootcover, shoulder pads, crotch pad and basket liner and you can choose from black, chilli pepper, fossil brown, blue sky and cool berry (my personal favourite). Weighing in at only 11 kilograms, the Britax Affinity is a fabulous lightweight option with a compact fold. Don’t be fooled by thinking they’ve skimped on other areas as a result – the Affinity stroller has a generous seat and fits children up to three years (or 17 kilograms), has a height adjustable handle, large shopping basket and impressive front and rear suspension. The Britax Affinity stroller also fits the Britax Safe-n-Sound Unity Infant Carrier ($399) when using adapters, which is a perfect travel combo if you are in and out of the car often. Both this car seat and the Affinity Carrycot ($199) are available in coordinating Affinity Color Pack colours. 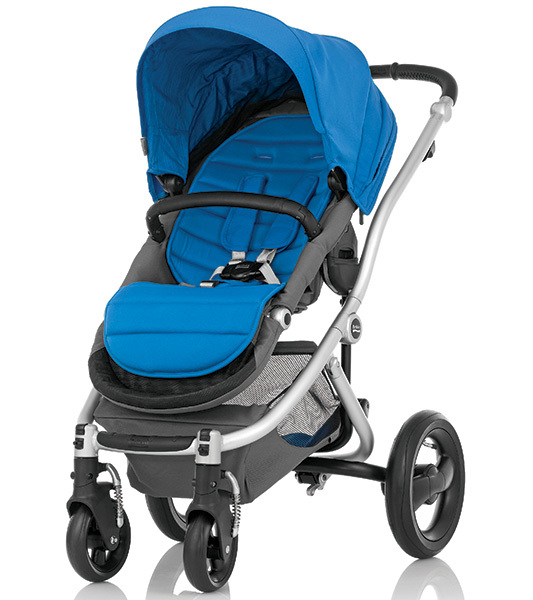 The Britax Affinity Stroller is priced $899 and will be available soon from Baby Bunting.